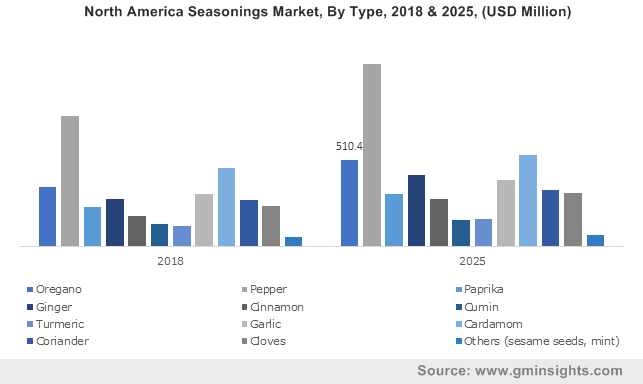 Global Seasonings Market size was valued at over USD 18 billion in 2018 and is anticipated to witness a CAGR over 4.5% up to 2025. Increasing demand for organic herbs & spices among consumers coupled with rise in ethnic food dishes consumption across the globe will drive seasonings market size. Factors such as healthy living, interest in new tastes and convenience foods are fueling industry growth. Growing multicultural population worldwide is also likely to increase cross border trade. Rising concern pertaining to consumption of hazardous additives in food products by health-conscious millennials has driven the producers to progressively settle on natural seasonings. Upsurge in the consumption of baked goods, confectionary products, ready-to-eat and ready-to-fry foods will provide positive scope for the business expansion. Growing disposable income and rapid product innovations are among the key factors promulgating the industry size. Significant uplift in the industrial end use product by food processing industry will foster myriad of opportunities for the industry participants. An upsurge in product usage in numerous food items owing to its remedial benefits will influence the overall seasonings market growth. Shifting demographic trends due to the rapid urbanization and increasing per capita income will proliferate the business share. In addition, rapid technological advancements & innovations in food processing equipment industry along with spice formulations will propel the industry size. Changing consumer preferences, eating habits, and online presence of food retail stores are among the major drivers that will bolster the industry growth. Strict government regulations and food safety acts by FDA, EFSA and other regulatory bodies across the globe pertaining to the hazardous food additives in several products will proliferate the business expansion. For instance, as per American health guidelines, suppliers must provide microbial contamination test certificates. However, fluctuating raw material prices coupled with more preference towards conventional spices may hamper global seasonings market growth. 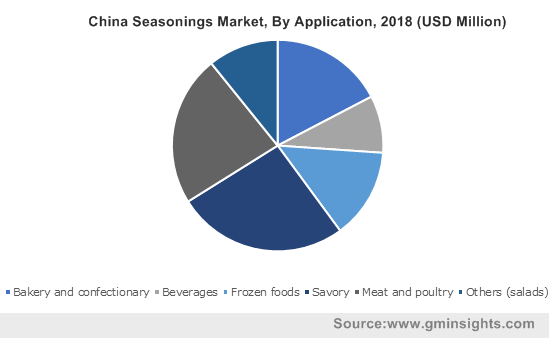 Seasonings market from pepper valued over USD 4 billion in 2018. Pepper is used as food preservative for its anti-bacterial property and is also a rich source of vitamin C, vitamin K, iron, manganese, and dietary fiber. Key benefits such as effective prevention against liver problems, cardiovascular diseases, and cancer will augment the segment growth. White peppercorn offering various business opportunities in several restaurants & foodservice outlets will proliferate the industry share. Cinnamon is anticipated to witness gains exceeding 6.5% in terms of revenue in the global seasonings market over the forecast period. It offers increased level of insulin sensitivity in human body and helps to prevent diseases such as respiratory illness, gynecological issues and digestive problems. Positive application outlook as flavor enhancer for food, bakery, and confectionary products will promulgate the overall industry growth. 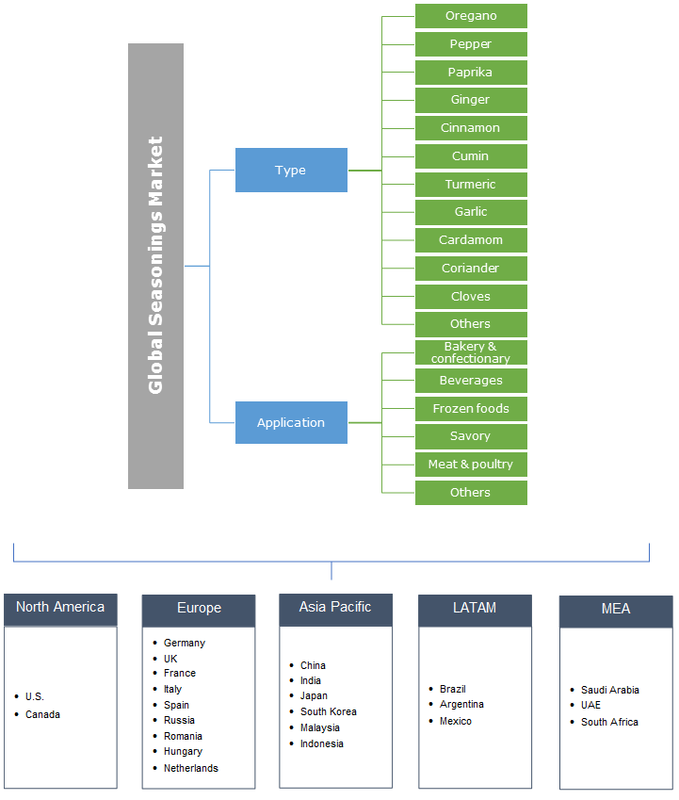 Global savory applications will register CAGR over 5% up to 2025. Savory snacks consumption is increasing across the globe owing to the changing consumer lifestyle and food consumption habits. The rising popularity of several savory snacks with different flavors due to the flavor additives and enhancers will provide positive outlook for the business expansion. Products such as extruded snacks, potato chips, nuts and seeds, popcorn, pretzel and meat snacks are becoming hugely popular among children and adults which in return will fuel the applications scope. Meat and poultry accounted for over 20% share in the overall seasonings market in 2018. Rising consumption of the convenient snacks such as meat jerky, meat snack bars, and meat sticks will augment the seasoning demand. For instance, as per USDA, American population consume 90 pounds of chicken per person annually, thus providing lucrative opportunities for industry players to launch new products. Additionally, key health supplements such as proteins, vitamin B, iron, zinc, magnesium, riboflavin will further support the application growth. Asia Pacific is projected to witness significant growth at over 4% in terms of revenue up to 2025. The growing demand for processed food and beverage products is expected to propel industry development. Strong production base along with shifting consumer trends towards western cuisines will promulgate the regional growth. In addition, large number of consumers tends to enhance their meals with spices for better taste & texture which in return will boost the business expansion. Europe accounted for more than 25% share in the global seasonings market in 2018. Shifting consumer preferences towards dried product form as flavor enhancer in several cuisines & dishes will boost the industry size in this region. Growing trend of healthy living and increasing popularity of organic spices will provide strong outlook for the business expansion. Furthermore, strong demand of convenience and ready to eat food products will fuel the product application scope. Global seasonings market share is highly competitive owing to the presence of dominating players such as McCormick & Company, Inc., Olam International, Corbion, Nestle, Ajinomoto Co., Associated British Foods PLC. The other notable industry participants include MDH Spices, Symega Food Ingredients Limited, Everest Spices, DS Group, Unilever, The Kraft Heinz Co., and Ariake Japan Company. Supply chain agreements, mergers & acquisitions, and product enhancements are among the key strategies adopted by major industry players. For instance, on 29th November 2018, The Kraft Heinz Co. acquired Primal Nutrition LLC for around USD 200 million. The acquisition helped the company to diversify and innovate their product portfolio. Seasonings market consists of companies that manufactures & formulates several products for the enhancement of flavor, essence, and taste. The global trade of seasonings comprises of around 85% of the overall trade across numerous economies in the dried and crude form. The Asian and European demographics are the major global centers for the processing and production of culinary spices that majorly improves the taste & texture of the several food products. India, China, and Indonesia are among the top economies across the globe for the exporting the seasonings and herbs to the other major economies such as U.S. and Canada.